The tiny pond creatures get a respite while I get my main microscope light repaired. But I have fired up the fiber optic illuminator, and mounted the low power objectives to a Labophot stand. 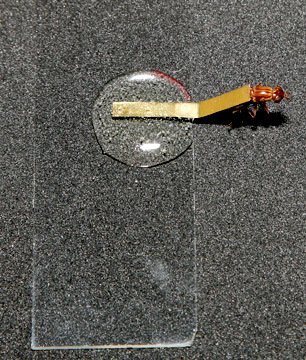 This means that the local insects better watch their backs! This (unidentified) fly image was actually made from two horizontal stacks... one for the top half, and a second for the bottom half. There were 26 images in the lower stack. The fly is illuminated from above. The green background comes from a piece of translucent green paper place over the condenser holder. (Condenser was removed, and the Labophot "base" light was used to illuminate the paper). Nikon 3X objective, 2.5X photo-eyepiece, Canon 350D. I really wish you would tell us how you agonized over getting the lighting right, making any number of bad shots, and various other problems before finally, in the wee hours of the morning, getting a few good images to stack! Shots like this are what most dream of making, yet I get the distinct impression you knocked this off during a commercial. Please, PLEASE tell me how difficult it was to get this image. As usual, another great shot - keep them coming. The first picture below is pretty much it. I made a hemispheric dome (from 1/2 a small plastic Christmas ornament) and spray painted the inside lightly with a matte white paint. Then I cut a hole in the top so that it would be a "press" fit over the front of the objective I like to use -- a Nikon 3X. (The dome is mounted a little "skewed" in this snapshot). The objective is an odd, older one, with an exceptional working distance. When a slide is in place and focused, the lower edge of the dome sits about 3 or 4mm above the stage. On either side I have a fiber optic light guide directed onto the surface of this mini "diffusion dome". I now use focusing lenses on the light guides. They are not really necessary, (I've done many shots without them) but they do allow keeping the guides "backed off" and out of the way, and provide a nice amount of adjustment by sliding the guide in and out of the lens. By moving the guides in the lenses, and moving them up/down, in/out, back and forth, you can really vary the lighting effect much more than might be expected. Broadly illuminating the dome gives a more diffuse light. Moving a guide in tight so that it only illuminates a small spot on the dome gives much more direction and "dimensionality" to the light. 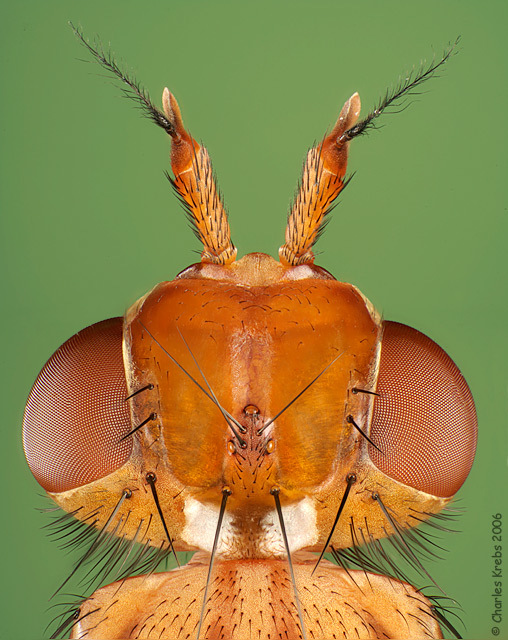 For some subjects this technique may be too "soft", but it does wonders for faceted eyes, shiny beetles, and iridescent wing scales. Underneath the stage you can see that the condenser has been removed. 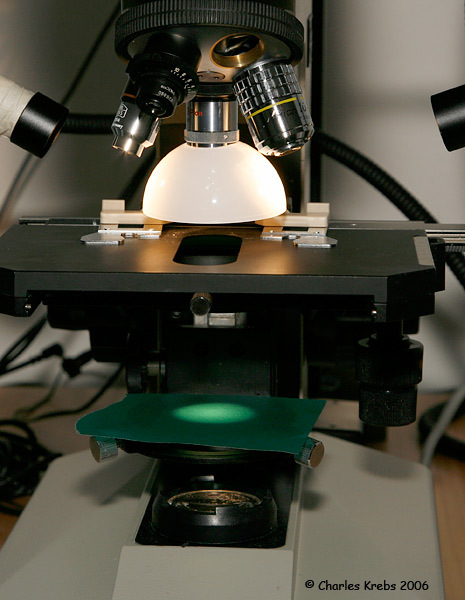 A piece of green semi-transparent paper has been placed on the condenser carrier, and this is then illuminated by the microscope light. This provides the background color. This second snapshot shows how the subject is held under the microscope. (In this shot the slide is resting on a piece of black foam, it is not on the microscope stage). I take an old slide and attach a thin strip of brass with a gob (I think that's the appropriate technical term!) of epoxy glue. Then I examine the specimen under a low power stereo-scope and determine the angle I want to photograph. The subject is then fastened (usually with cyano-acrylic adhesive or epoxy... Elmers if I want to be able to remove the adhesive with water) to the brass strip as close as posible to the orientation I want. Then, under the stereo-scope, I can bend the brass strip any which way with tweezers to get the orientation "perfect". Notice that the subject is held out in the "air", not over the glass of the slide. It will extend out over the opening in the microscope stage. If you mount the subject over the glass slide, unwanted reflections from the broad "dome" light source will drive you crazy. (As can reflections from the condenser glass if it is left in it's normal position). Preparing and adjusting these specimens for photography became so much easier once I started using these brass strips as shown here. They are stiff enough to hold the subject rigidly, but can be easily bent into just about any orientation desired. So there you have it! The Nikon Small World fly picture was done exactly this way, but I used a Zeiss Plan 2.5X, with a "dome" made from 1/2 of a ping-pong ball. Many thanks for sharing your methods (with us mortals... ). The hemispherical lighting diffuser is very clever, I will have to try it out. All the queen yellow jackets have come out in the past week or so looking for homes...many in my barn, so I've got lots of specimens I could use your illumination methods on. Thanks again, great shot. After you show how it's done, it looks so simple; the difficulty is figuring it out in the first place. No doubt your background in photography has allowed you to come up with a lot of these ideas from long experience and many trials and errors. I expect there will be a run on thin brass strips today! Thanks for sharing your tricks and methods. BTW - ordered the D200 from B&H last night! Beware nothin'...it's a lucky insect that gets immortalized under your scope. Wonderfully done and thanks for the tips. Charlie, another image that makes me staring at the screen for hours. Brilliant! Excellent resolution and color. "Uniform colored background" -- check! "Bendable mounting rod" -- check! "Deep stack, wide aperture" -- check, check! How odd...when I utter the same incantation, it just doesn't have the same effect. This is beautiful. There just ain't no other word.